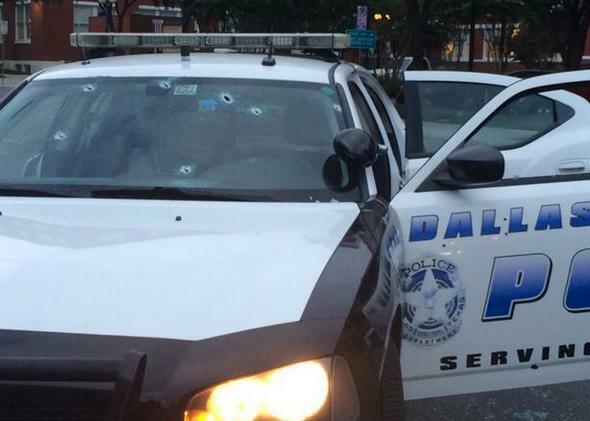 Suspect in dallas police attack shot by sniper. Several bullet holes are seen in the windshield of a police patrol car in Dallas, Texas, in this handout photo released by the Dallas Police Department on June 13, 2015. UPDATE at 1:51 p.m.: It’s official. After a few back and forths, Dallas police confirms the suspect is dead. UPDATE at 1 p.m.: The Associated Press withdrew its story confirming the suspect’s death, police say they suspect he is dead but have not confirmed yet. Dallas police did publish several photographs on Twitter that show just how much damage the shooting rampage caused. UPDATE at 11:55 a.m.: Authorities confirmed the suspect was killed, according to the Associated Press. A sniper appears to have shot the suspect at around 5 a.m. but it took several hours for the police to confirm the death because they feared his armored van would be packed with explosives. Dallas police say it’s likely but are not officially confirming anything. Original post: A bizarre attack on Dallas police headquarters early Saturday led to a police chase of an armored van and a sniper shot that is thought to have killed the suspect. Authorities have not been able to confirm the suspect is dead. There was concern that there could be explosives in the van so police dispatched a robot to examine the vehicle. The suspect told police negotiators that he had “C4”explosives in the van, reports the Associated Press.